Thanks for the information. The brewery was called Barclay Perkins after the Barclays who bought it, and who was Henry Thrale's manager. No Clayton - sorry! Thank you for the bit about the brewery. I have sent it on to my cousin in Canada who gave me the information in the beginning! 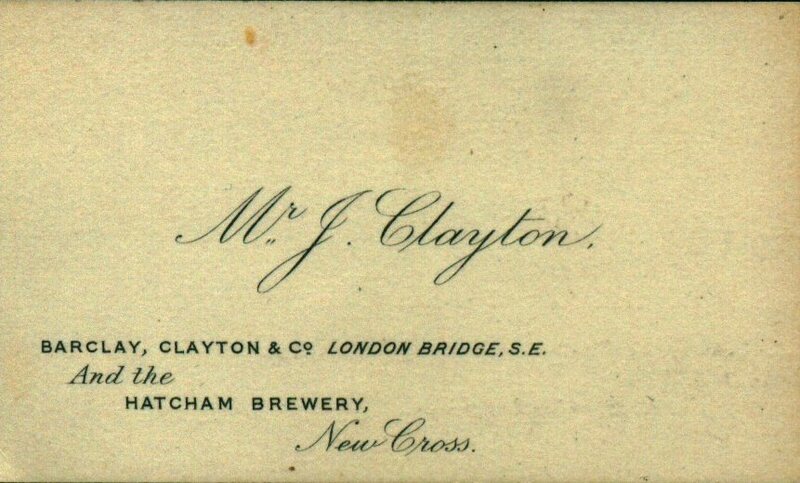 Apparently the brewery became Barclay, Clayton Brewery after Thrale's. The Clayton was my great grandfather's brother on another side of my family unrelated to the Nettleton side. I don't know if you can confirm that this is correct. Re: Nettleton's: Catherine Jewell Nettleton, born in 1793, married Jonathan Parsons in 1814. They had a daughter of the same name born 1817 who married Robert Nettleton in 1840. Robert and Catherine had a daughter of the same name born in 1843. Thanks for the clarification on the Nettletons, I have updated the family tree - it all makes more sense now. I have done some research on the Clayton's and can say with reasonable confidence, that there was no Barclay Perkins connection. Thrale sold quarter shares to David Barclay, Robert Barclay, Silvanus Bevan and John Perkins. After Barclay Perkins, the name changed to Courage. I have books on the breweries history and loads of books on Thrale affairs, none even mention a Clayton. For the family of Clayton, who leased land from the Duchy of Cornwall in Kennington and rank as one of the most important early developers of South London, Clayton Street near the Oval is a quite insufficient memorial, although not far off, at St Thomas's Hospital in Lambeth, the founder of the family fortunes, Sir Robert Clayton, a seventeenth-century scrivener, is honoured as a philanthropist in a statue by Grinling Gibbons. He was a highly influential businessman, one to whom many an old patrician family has cause to be grateful. Clayton transformed the market for mortgages, he initiated loans which avoided the constraints of the usury laws, and devised trusts for his clients - most famously for the second Duke of Buckingham and for William, Lord Russell - which afforded protection against confiscation by the state. Clayton and his partner John Morris were active investors in City real estate after the Great Fire, building residential and commercial property for letting. In Surrey, as well as buying a thirty-one-year lease from the Duchy of Cornwall, they invested in land further afield with purchases of the manors of Marden and Lagham near Godstone, twenty miles away from London, property which remained in the Clayton family - Morris having left his share to his partner - until the twentieth century. The adjacent manor of Bletchingley, which Sir Robert also bought, provided him and subsequent Claytons with a useful parliamentary pocket borough. Robert Clayton's contemporary and fellow magnate Sir Stephen Fox bought a lease on neighbouring land in South Lambeth from the Archbishop of Canterbury in 1701. There were regular renewals, and between 1820 and 1824 Stephen Fox's great-grandson, the host and politician the third Lord Holland, took out new leases with expiry set for 1923, and let the land to builders and other developers.